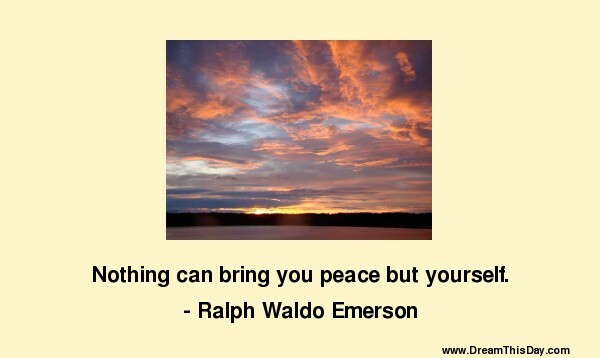 Please enjoy these quotes about Inner Peace from my collection of quotes and sayings. stability and tools that I use. There is no such thing as inner peace. There is only nervousness or death. Any attempt to prove otherwise constitutes unacceptable behavior. core of a stable international zone. If there's no inner peace, people can't give it to you. The husband can't give it to you. Your children can't give it to you. You have to give it to you. Never continue in a job you don't enjoy. you'll like yourself, you'll have inner peace. you will have had more success than you could possibly have imagined. Thank you for visiting: Inner Peace Quotes and Sayings - Quotes about Inner Peace.